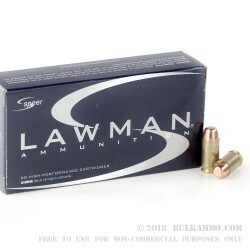 Speer Lawman ammo is the perfect practice round for anyone using Speer’s widely acclaimed Gold Dot self defense rounds. Each Lawman load is carefully engineered to produce identical ballistics to its Gold Dot counterpart, allowing shooters to follow the common adage of “shoot what you carry” without breaking the bank on premium hollow-points. This particular .45 ACP load, ideal for Glock 21 and 1911 users, propels a 230-grain bullet at 845 feet per second. The bullet uses a total metal jacket, which costs less to produce than a full metal jacket and has the added advantage of covering the base of the bullet for reduced lead exposure. The process leaves the bullet vulnerable to shearing in a ported barrel; however, this is a non-issue in carry and law enforcement weapons Lawman is designed for. 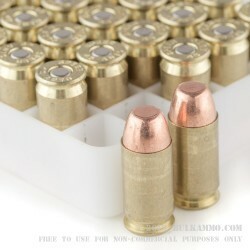 All Lawman ammunition uses reloadable, Boxer-primed brass casings.